Heat oven to 350°F. Line shallow roasting pan with foil. Place ham on rack in roasting pan. Insert ovenproof meat thermometer in ham so tip is in center of thickest part of meat and does not touch bone. In 1-quart saucepan, heat wine, thyme sprigs and shallot to boiling over medium-high heat. Reduce heat; simmer uncovered 7 to 8 minutes or until wine is reduced to 1/2 cup. Remove from heat. Discard thyme sprigs. Stir in preserves, brown sugar and mustard. 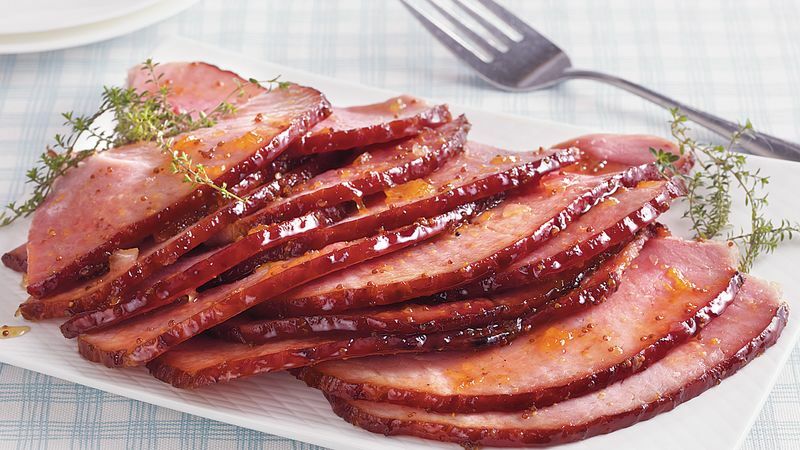 Brush half of glaze mixture over ham. Bake uncovered 1 hour 30 minutes, basting with remaining glaze mixture every 30 minutes. Cover loosely with foil; bake 30 minutes longer or until thermometer reads at least 140°F. Let stand 15 minutes before slicing.